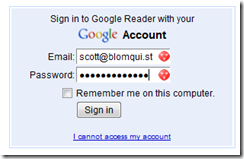 Roy Leban blogs about stupid password policies over at his thisUser blog. I’ve got some good news for Roy and his readers: I’m currently making a living turning all of the things that he rants about into relics of the unenlightened past. And while I have to concede that it’s a slow uphill climb, there are some very exciting things that you can do today to start simplifying your online life. The first one worth mentioning is a thing called OpenID, which is pretty much just single sign-on for the Internet. This is not a terribly new idea–Microsoft has been pushing for something very similar in the form of Microsoft Passport Windows Live ID for around a decade. OpenID has the added benefit that you can use it even if you’re not convinced you’d like to involve Microsoft in your online life. If you want an OpenID, I’d suggest myVidoop. (Full disclosure: I’m the CTO of the company that built it.) We’re one of the better-known OpenID providers, and unlike the other OpenID providers, we actually have a way of making money. I’d be thrilled if you’d give myVidoop and our password management plug-in a try and give us your frankest feedback over on GetSatisfaction. Finally, I’ll mention for the benefit of the web site owners in the audience, there’s an experimental Vidoop project called Email to ID. If you have a web site that would be using OpenID if only most users already had one, Email to ID is your solution. Email to ID gives every user an OpenID, and the authentication mechanism is their email. (As strange as that sounds, that’s the way things already work only less conveniently–you can reset pretty much any of your passwords by simply requesting an email, so we just made the security dependency on your email box explicit.) You can find some more detailed analysis of Email to ID at Silicon Florist. This entry was written by Scott Blomquist, posted on July 3, 2008 at 12:26 am, filed under OpenID, OpenID Ideas, Technology, Vidoop. Bookmark the permalink. Follow any comments here with the RSS feed for this post. Post a comment or leave a trackback: Trackback URL. I think both OpenID and Vidoop are interesting ideas. Of course, they don’t solve the general problem of stupid security policies in general. And OpenID providers can impose rules that are just as silly as any random provider. But, I can switch OpenID providers to one that I like. Email to ID addresses one of the key flaws in Open ID — domains are techy while email addresses are for the masses. It could potentially make a big difference in adoption. So glad to have you guys as part of the Portland tech community. You’re doing great work. And I simply can’t wait to see what the future holds.